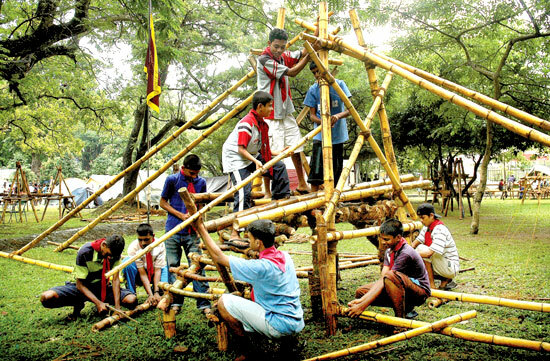 Uplift Lives: How to be a Scout in Sri Lanka? How to be a Scout in Sri Lanka? I got the opportunity to do an exclusive interview with the programme commissioner for the National Scout Headquarters of Sri Lanka - Mr. Rohan Wirasekara. He is also the Scout Leader for the Royal College, Colombo Scout Group for three decades. It is a large Scout Group with about 1,000 Cubs & Scouts. Question - Why do you think a student should be a Scout? Answer - Because Scouting trains the students to be fit citizens with values. Boys need to try fun and adventurous things. In Scouting students always try new things on their own. They are capable of doing many things. They handle duties, obey the orders, manage teams, meeting new friends, provide service to others and do have a lot of adventures . Through those activities they build self confidence, leadership skills and become a cheerful and a capable persons. Most of the people who has done Scouting are well established in the society today. Question – What difference you see in doing a sport and doing Scouting ? Answer – I’ll give you an example. Say a student is playing cricket. He is trained full time for a single target. He is trained to face the balls, bowling techniques, batting techniques and finally by hook or crook to win the match for the school. But in Scouting, Scouts can involve in any sport or activity for a different purpose. That is to be a good and fit citizen, with a strong personality.. A good Scout Leader can use any sport or activity to achieve this goal. In scouting, a student gets to do many things in life rather than a single sport. It has a higher target with higher values. Question – How to become a Scout in Sri Lanka? Answer – You can join your school’s Scout Group. But it will depend on your age. You will have to join the category which you belong to. Then you can meet the relevant Scout Leader/ Scout Leader of the school and request him/her to enroll you. If there is no Scout Group established in your school, then you could request the Principal of the school to take necessary steps to start a Scout Group. If the District Commissioner is not reachable or if there is no way to contact him, the Principal can then directly contact National Scout Headquarters. Question – What are the initial requirements to start a Scout Group in a school? 2. There has to be a Responsible Authority to take care of the Scout Group. It is called the “Sponsoring Authority”. In most cases it is the relevant school that act as the Sponsoring Authority for the Scout Group. For example, Royal College is the Sponsoring Authority for the Royal College Scout Group. Certain Scout Groups have Sponsors such as temples, churches, Rotary club, etc. Bellanwila temple is also sponsoring a Scout Group. 3. School should get a trained Scout leader (District commissioners can arrange this), or arrange one of the teachers or a nominee of the Principal to follow a Phase 1 Scout Leader Training course. Of course the Scout Group has to be registered with the Scout H.Q. Only thing is when practicing Scouting, children will require uniforms, shoes, tents, flags etc. But you know, a talented and willing Scout Leader can overcome all these hurdles. Uniforms are not a must always. While we encourage all Scouts to be properly & smartly dressed in the correct uniform, there are many Scouts specially in remote areas who would use their School uniform, that is a white shirt and a pair of blue shorts. They would pin the badges on this shirt. But they all have a Scarf, or a neckerchief to indicate their Scout Group. Most expensive item would be the tents. A tent which can accommodate 6-7 boys cost around Rs 10,000 to 15,000. But that’s also not a preventing factor. Recently I saw a school which came to a camp used one of the sails of a sail boat prepared as a tent. So with creativity and innovativeness, you can overcome all those. Other than for that there is a job week which is now called the “Service & Relationship” week, annually. A week dedicated for community service and to raise funds. The idea is to do a job for someone in the area and earn some money for it. The money raised is used for the Scout Group’s expenses. Well… almost anyone can be a Scout Leader. Usually the teachers and Rover Scouts become trainers by obtaining the Scout Leader training. There are 5 phases of the training for Scout Leaders. Supervisor from the headquarters to track his progress. Currently there’s a massive shortage of good quality Scout Leaders, because this is purely a voluntary service. It’s more financially beneficial for the teachers to do a tuition class during that time and earn some money. But Scouting will give a the Scout Leader a greater satisfaction. Therefore those who love children and have time to spend on them and those who love service oriented work can request to attend these trainings provided if they willing to run a Scout Group. Question – For the information of any interested party, can you briefly explain what are the activities that Scouts do? Question – How many camps per year a particular Scout Group would have? What are the constraints? The biggest cost involved in an outstation camp is the transport cost. If it is held in school, the main cost would be for the food.. Scouts find money for their Scout Group through the Service & Relationship week each year. They go to houses and work places and help their owners with small work they can do. People give them work and then give some amount of money for their effort. It’s like this. Scout Districts are different from administrative districts. 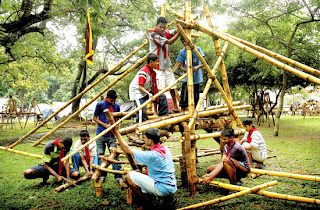 There are approx 35 Scout Districts and nearly 35,000 Scouts in Sri Lanka. By 2013 we are planning to expand the Scout numbers to 100,000. The World Scout Bureau is helping us in this regard. You can also contact “Kasun” at the Hq. phone 0115840687 or 0112433131. Kasun would convey the message to me to take necessary action. Editior's note - My heartiest thanks goes to Mr. Rohan Wirasekara for sharing this information.